During my childhood, we had many pets (cats, gerbils, hamsters, fish, turtles, newts, a parakeet, a dog). But what I ask from and need to give to our working animals demands a greater level of involvement, decision-making, and commitment. I did not grow up learning the skills and mindset needed for such work. My first jobs in agriculture were vegetable and fruit operations. A few generations ago all farms were diversified – they had both animals and plants. Nowadays, it’s much more common to find them focused on just one. I was also a vegetarian then vegan when I first got involved in farming, so it didn’t occur to me to think about adding animals. However, I developed health problems related to my restricted diet. With eggs, milk and meat back on my plate, I wanted to be sure the beings making those products were well treated, for their sake and mine (how can sickly animals ever produce healthy food?). I also discovered good research on the benefits of animals appropriately used in agriculture. If I wanted my soil and land to thrive, animals were looking to be an important addition. So, I read, researched and went to classes. I got bees, then chickens and ducks. While not at all simple, there is a lot of information and support for bee & poultry keepers. Moving on to four-legged mammals – that felt like a whole other world. 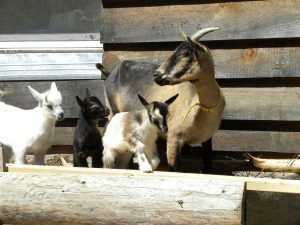 We brought our first goats home in the summer of 2011. Honey and Cocoa were 3 months old. 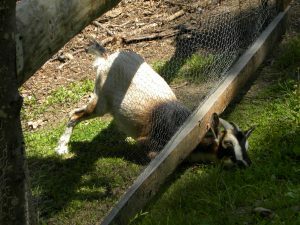 Every morning for at least the next 3 months, I woke up and said to Steve: “do you think the goats are still alive?” I was terrified of doing this wrong! This feeling was especially strong because of the bad experiences people seemed to relish sharing with us. We heard and read about the many health problems we were likely to see – diseases, mineral deficiencies and parasites. 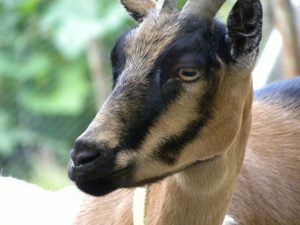 Coming from a background of organic farming, I believed that organic and natural management options were possibly the key to avoiding some of the problems, but most goat keepers I talked to disagreed with me. One even told me “if you feed the kids organic grain they’ll likely be dead within weeks.” Thus my obsession those early months with their possible sudden demise. Luckily I did find a few people having great results with natural methods so I didn’t feel completely alone. 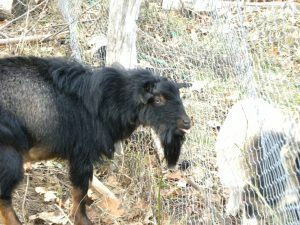 Now, six years later, I am happy to report that not only are our goats alive, they have thrived and multiplied! In fact, most of the problems we were braced for still haven’t come to pass. We have not had problems with: internal parasites, lack of fertility, birthing complications, coccidiosis, mastitis, pneumonia or other infections, or low selenium. 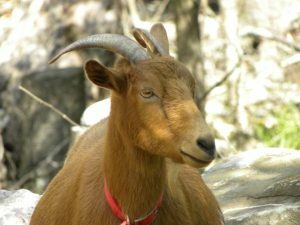 The three scariest goat diseases – CAE, CL & Johnnes – haven’t shown up since we were careful to purchase from disease-free herds and test regularly. I do watch them for copper deficiency, as we have seen some signs of that now and then. They have thick winter coats and shiny summer hair. 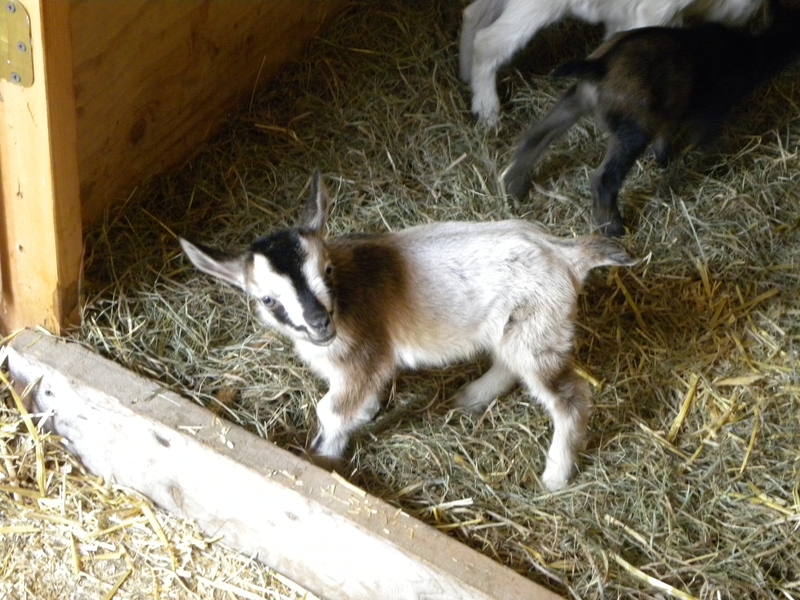 They behave appropriately, are friendly, curious and active. The problems we have faced fall more in the first aid category: a dislocated leg, diarrhea after eating a poisonous leaf, a couple of winter lice cases. natural rearing has been a success. 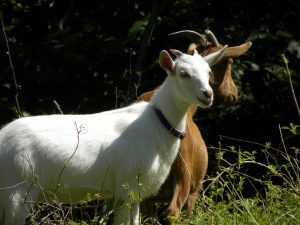 To be more specific, I think these practices have particularly helped: choosing healthy stock, dam-raising rather than bottle-raising kids, rotational grazing, a varied diet, mineralizing our land, no prophylactic medications, and little to no grain. 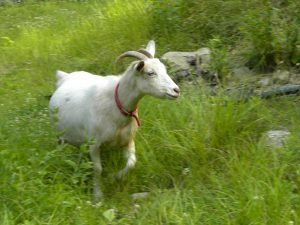 From my permaculture training I also remember to observe my animals and learn as much as I can from them about how they should live, what’s working or not. She has a point, the grass does look greener on the other side! And, no, she’s not stuck! 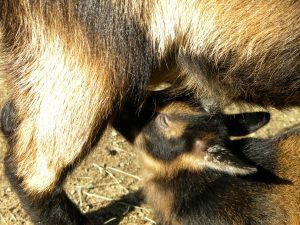 Still, I do find some normal aspects of goatkeeping challenging: managing breeding including the stinky bucks, birthing worries, harvesting excess animals, and being there every single day to milk. And just generally still worrying about everything that could go wrong. Sometimes I wonder if this is really for me, if I can keep it up. But, when I look at how happy and healthy they are and when we eat the fabulously healthy products we get from them… it seems a shame to stop. Next… breeding season is almost upon us and I plan to share some of that with you. Even some videos of their behavior. Alas, I can’t capture the buck smell for you – I’ll never be able to describe it adequately!